Summer is just around the corner, and it’s time to get our skin looking and feeling vibrant, glowing, and healthy. For those with dry skin, maintaining that gorgeous radiance out in the sun isn’t so easy; drier skin types are prone to becoming immensely dehydrated, flaky, and just overall tough to deal with during the summer months. Because of this, having the right routine and products for your face is so very important, and keeping it all consistent is what can make or break your skin’s healthy glow. With that being said, here’s a foolproof skincare routine to keep up with, perfect for when the sun’s got your sensitive face peeling, flaking, and highly irritated. We all know that it’s important to wash your face daily, but what some may not realize is that a lot of face washes can do too much to our skin, causing it to become extremely dry and irritated. Those over-exfoliating washes with the harshest of chemicals can be harmful to the driest types of skin during the summer, so it’s sometimes better to go for something gentle, yet effective for your face. A mild face wash can be a blessing for many during the summer, as it can give you just the right amount of what your skin needs to be clean and free of dirt and oil. When a cleanser contains certain ingredients that over-exfoliate, it can strip your face of way too much of the important oils and layers of skin, leaving it to overcompensate and cause even more oiliness, drying, or irritation. Now, just because a cleanser is gentle doesn’t mean it’s not effective. Don’t be afraid to try a calmer wash every morning and night this summer, something that can really care for your skin instead of strip all the good stuff away. One great mild cleanser is the Olay Sensitive Foaming Face Wash, which is formulated specifically for the most sensitive of skin and can truly cleanse it properly during the summertime. 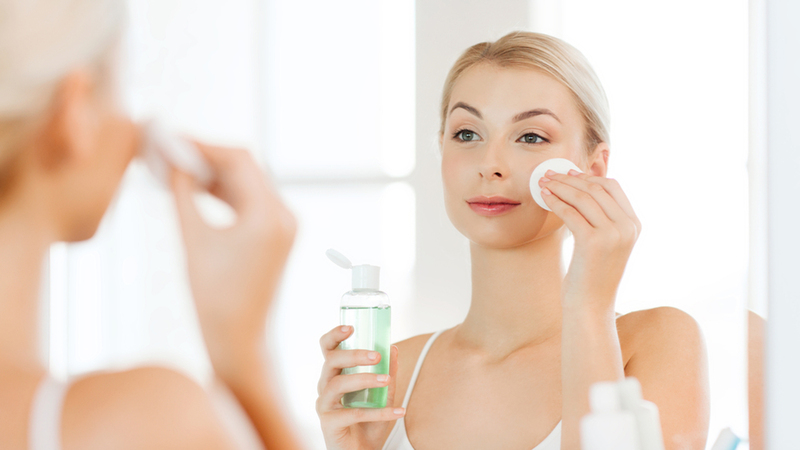 While using a toner on the skin isn’t always seen as necessary for some, its use can be an important step to add to a skincare routine during the summer, especially for dry skin. Different toners serve different purposes, and if the sun starts to dry out your sensitive skin, using a hydrating toner might save your summer. Yes, it’s an extra step, but it’s an important one that can help maintain a healthy-looking, comfortable face. Applying a hydrating toner, like the Lancome Tonique Douceur Softening Hydrating Toner, can act as a method of removing any other dirt and oil that may have been left behind after washing your face. When choosing the right toner for dry skin, it’s important to remember a major key point; making sure your toner is alcohol-free is vital for drier skin types, as alcohol can quickly dehydrate your face and cause immense flaking. Toner can be applied to your face in the morning and night; if you find that consistent use is a bit too much for your skin, try using it once a day, and see if that makes any difference. Finding the right moisturizer for dry skin is sometimes a tough task; not many moisturizing products provide skin with enough hydration, and others can be so oily that they end up breaking out skin with acne and other harsh reactions. First things first: choose a moisturizer with SPF in it, especially during the summer. Protecting your face against the damaging rays from the sun can help prevent future damage and visible signs of aging, as well as continue to keep your skin healthy and safe from the summer’s harsh environmental factors. Once you’ve got that down, look for a moisturizer with ingredients like aloe and vitamin E; not only will your skin feel hydrated, but it will help calm any burning your skin soaked up out in the sun. A great moisturizer with all of these properties is the Olay Complete All Day UV Moisturizer, consisting of Aloe Vera, SPF 15, and Vitamin E and C.
A little tip: when applying moisturizer to dry skin, don’t feel the need to slap on too much. Overcompensation is something your skin does well, and if your skin is feeling too moisturized, it will bring out more dryness and counter some of that excessive moisture. Gently pat in your moisturizer instead of wiping it all over your face; your skin can absorb the product better this way. Overall, the summer months can be so very harsh towards the driest skin types, but a solid skincare routine can aid in making you feel confident about and comfortable in your own skin. Staying consistent with your routine can really give your once flaky skin that beautiful, natural glow, so treat your face with some TLC this summer, and shine like a star out in the sun! Dani has a huge passion for all things beauty and skincare. She hopes that sharing her experiences and advice with her readers can aid in making them feel as confident and beautiful as possible. To read more of Dani’s beauty tips, tutorials, and reviews, visit her blog at Alifetimeofskinwars.